Did anyone else watch Barefoot Contessa in high school? I was really into cooking shows (and Laguna Beach) back then. Honestly, I rolled my eyes at a lot of cooking shows, mostly because I felt that the people were trying too hard to make their show more entertaining, turning it into a disingenuous smorgasbord of bad jokes and fried food. On the other hand, Ina Garten's show, Barefoot Contessa, somehow seems more genuine (maybe because of all the natural light in her kitchen?) But really, Ina just makes the entire process of cooking and baking seem clean, simple, and stress-free. And please, Ina’s cute banter about Jeffrey and how much he’s going to enjoy the garlic chicken and fancy brownies? Too cute. I mean, just look at this Buzzfeed article! Okay, enough Ina talk. I'm not a huge fish eater, but I think this recipe is undeniably delicious and is one of Kelvin’s favorites (see that Jeffrey-parallel there? I just can't stop.) And heck – this recipe has panko!!! Panko bread crumbs are high up on an unending list of Japan’s culinary gifts to the world. Here’s the brand I use. They’re not super fancy, but they’re yummy, affordable, and available at many Asian and grocery stores. This recipe is slightly adapted from Ina Garten’s recipe. I’ve set the recipe to be for two people – you and your “Jeffrey.” 😉 If you’re making it for 4 or more, just double or triple the recipe to fit your needs. One little warning: in addition to the ingredients below, you’ll need an ovenproof skillet. Mix the panko ingredients together in a small bowl: panko, cilantro, lemon zest, salt, pepper, garlic powder, and 1 tablespoon of oil. Gently mix until all ingredients are incorporated, and set aside. 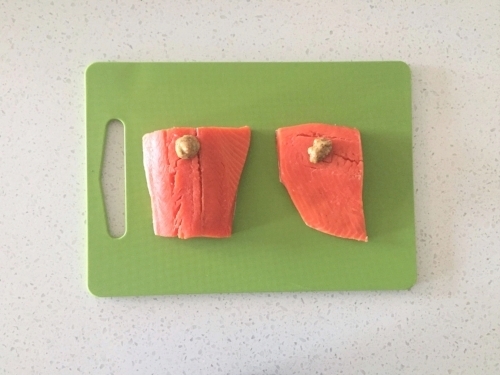 Place the salmon fillets skin side down on a clean surface. Evenly coat the salmon with mustard with a pastry brush or the back of a spoon. The mustard will help the panko mix stick to the salmon. Scoop the panko mixture evenly on top of the mustard-brushed salmon. It’ll be messy, but don’t be shy! Load the goodies on. I like to press the crumb mixture down with my hands a bit. Transfer the pan into the oven (don’t forget your oven mitt!) Bake the salmon for about 4-5 minutes, until the salmon is cooked through and the panko is browned a bit. Take out of the oven. Cover loosely with aluminum foil for 5-10 minutes to lock in the moisture. Serve warm. Squeeze on some fresh lemon juice if you’d like. We enjoy this dish with some starch like rice or roasted sweet potatoes and stir fry veggies. Yum!